I've been on a sewing kick lately. Well, more than I usually am! 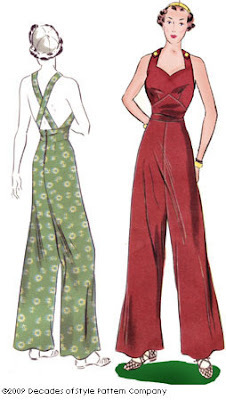 I was surfing the internet tonight looking for some patterns when I stumbled across this site, Decades of Style. I'm in hog heaven, as I'm sure you all know. This place has gorgeous patterns from the 1900's to the 1950's up to a bust size of 46! I know, I was surprised too, but believe it, honey! These are reproduction patterns, mind you so they are easier to follow than most vintage ones. Get out your needles and thread, girls! For those of you who don't know how to sew but want to learn, I recommend trying your hand at an apron. A simple cotton (like the kind used for quilts) is one of the best to begin with. The One-yard bias cut flapper apron here is a good start. Simplicity also has great vintage apron patterns that you can buy at your local fabric store. If any of you non-sewing gals have a sewing success, let me know so I can send my kudos! Be careful, though- sewing is very addictive! Ciao Brittany , Hi there in U.S. ! I visited your Great Blog and I must say I love it ! your Blog is very cute/lovely and your look & style is wonderful,Faboluos!...Cheers! 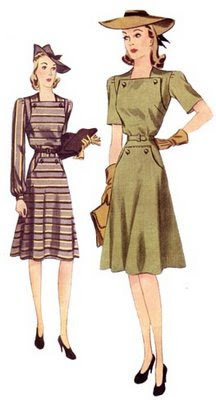 I do Love the retrò, vintage style/fashion as it really celebrate the Women with curves and I think it has something "Naive and Joy of Life feeling" that in the modern fashion is disapperead. Greetings from Italy/Sicily by a fellow naive Artist who love painting only buxom, Curvy Women and to celebrate their sparkling Beauty. ..Keep up the Great work and...hope to see photos of you wearing something Italian vintage fashion. by the way, do you like also Italian/Sicilian Fashion? Oh, thanks for reminding me about this site. I'm going to go shop for some great patterns right now! !